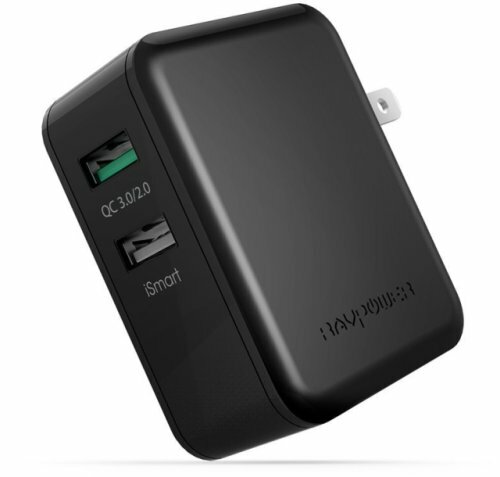 Qualcomm Quickcharge is one of the most handy technologies introduced recently in powerbanks. 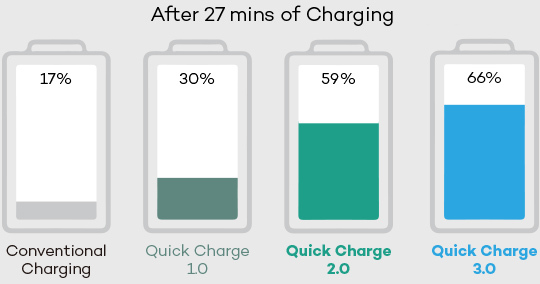 Qualcomm Quickcharge aims at maximising the charging speed of battery-powered devices such as smartphones, laptops and tablets by identifying, analyzing and optimizing the charging process of the batteries of the smartphones/laptops. This ensures that the batteries are charged with the maximum possible current. This drastically increases the charging speeds and maximises the utility of backup power solutions such as powerbanks. Powerbanks with Quickcharge usually have Quickcharge Output. However, the latest high-end powerbanks such as the RAVPower 20100 mah with USB-C also come with Quickcharge Input where the powerbank itself benefits from superfast charging. Quickcharge Input feature in a powerbank means that the powerbank itself can be quickly charged using Quickcharge supported wall charger such as RAVPower 30W Dual USB Wall Charger Quick Charger. Huge capacity powerbanks such as 20,000 mAH or 26,800 mAH require almost 20-24 hours to recharge if they are charged by regular chargers (1.1 A+). High-amp chargers (2.4 A+) can charge such large capacity powerbanks in 8 to 10 hours. The latest Quickcharge 3.0 compatible chargers and powerbanks of 20,000 or 26,800 mAH capacity can be charged in as little as 4.5 to 6 hours. This drastic reduction in recharge times makes your powerbank ready for action within hours. QuickCharge output feature means that the powerbanks can charge devices blazing fast using Quickcharge. However, please note that ONLY the devices with built-in QuickCharge support will be able to take advantage of fast charging through the Quickcharge port. Devices that do NOT support Quickcharge will be still charged by the quickcharge port at regular USB charging current (1.1 A to 2A) . This means that you do not have to worry about not being able to use that QuickCharge port to charge your non-supported device. Similarly, all the Quickcharge technology versions – Quickcharge 1.0, Quickcharge 2.0 and Quickcharge 3.0 are backwards-compatible. This means that a latest Quickcharge 3.0 powerbank will perfectly support smartphones or tablets with older Quickcharge 2.0 or 1.0 charging BUT with reduced charging speed than is poosible with Quickcharge 3.0. To charge your Quickcharge Input supporting powerbank such as RAVPower 20100, you will need a Quickcharge Wall Charger such as RAVPower 30W Dual USB Wall Charger Quick Charger with iSmart. A Quickcharge compatible wall charger can not only charge your QuickCharge powerbank but can also directly charge your compatible QC enabled smartphones and tablets. The charging speeds will be almost 4 times as fast as regular 1.1A output USB chargers. An increasing number of of the latest smartphones, tablets and laptops support Qualcomm Quickcharge compatible. Here is a comprehensive list of Smartphones and Tablets with Qualcomm Quickcharge Support.